Ferrari World Abu Dhabi is set to take its place as the largest indoor theme park in the world later today when the attraction opens to the public. Celebrations were delayed for a week following the untimely death of Sheikh Saqr bin Mohammed Al Qasimi, the ruler of Abu Dhabi’s neighbouring emirate Ras Al Khaimah. However, everything is now in place for the spectacular opening ceremony. Some 10,000 guests are expected to attend the opening, with the global media spotlight fixed firmly on the location. Even before its opening Ferrari World has attracted intense anticipation, with glowing reports from those who have been granted an exclusive preview suggesting fans will not be disappointed. The 40-acre park will be the world’s only Ferrari theme park and the largest attraction of its kind. The opening will come just ahead of the Abu Dhabi Grand Prix which is due to take place at the neighbouring Yas Marina Circuit on November 14th. Sports fans in town won’t be disappointed with the facilities on offer either. Housed under one of the most iconic structures in the Middle East, the theme world has a range of attractions the will keep almost every member of a family entertained. The roof, which creates a fascinating visual as one drives past on the new Shaikh Khalifa Highway, spans over 200,000 square metres while the famous prancing horse logo of the all-conquering car makers is a 65 metres by 48.5 metres. “Ferrari World Abu Dhabi offers an exhilarating experience for families and fans alike which they will cherish forever,” said Andy Keeling, park manager of Ferrari World Abu Dhabi. 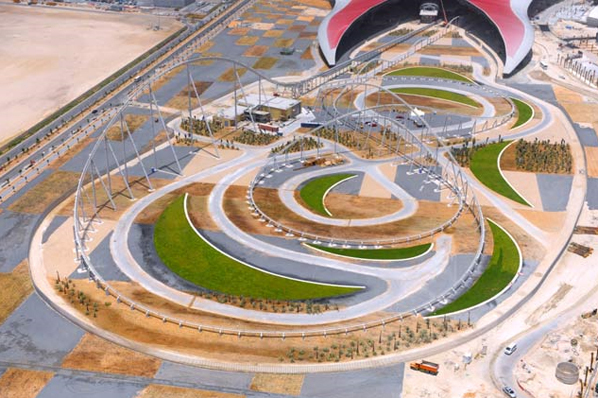 “There’s more to Ferrari World Abu Dhabi than the thrill of speed racing and powerful cars. The park celebrates Ferrari’s past and present, and pays homage to its Italian roots in a bespoke and innovative way, from the stunning structure through to the attractions and various experiences offered,” he continued. “Few brands in the world are capable of eliciting such strong reactions of passion and fervour. Also in the Middle East this week, World Mobi launched its new city guide to Abu Dhabi. World Mobi offers the most comprehensive mobile travel guides available, with over 800 cities in 200 countries listed. Each is developed by the World Mobi team to combine into a single global travel directory. Abu Dhabi.Mobi is the latest in this illustrious line up, offering click to call functionality – which means no scribbling down telephone numbers. With Ferrari World opening, World.Mobi launching and the arrival of the Formula 1 carnival all expected in November Abu Dhabi might be expected to have its hands full. But there is also one more exciting item on the agenda – the small matter of the World Travel Awards Grand Final. Taking place in London on November 7th, the Abu Dhabi Tourist Board is nominated in several leading categories including World’s Leading Marketing Campaign and World’s Leading Tourist Board. Check back on the night to see who walked away with the top prizes.